The upcoming OS 12 update for the Apple HomePod is slated to bring a slew of new features to the smart speaker including the ability to make and receive calls when paired with an iPhone and set multiple timers. With the upcoming MacOS Mojave update, the HomePod can also be controlled directly from the Mac. The Apple HomePod will be getting some iOS 12 love and this will be a major update for the capabilities of the smart speaker. 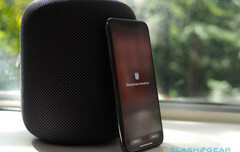 French site iGeneration has discovered that the iOS 12 beta update for the HomePod enables several features, which makes the HomePod more competitive with other smart speakers from Amazon and Google. The update will bring a host of new features but probably the most important one would be the ability to make and receive calls from the HomePod when paired with an iPhone. Not only that, you'd also be able to redial, search call logs, listen to voicemail or dial emergency. The HomePod will also be able to use the 'Locate my iPhone' and manage multiple timers. Those using FaceTime can use the HomePod to take part in a FaceTime call as audio-only participants. The upcoming MacOS Mojave update will enable controlling the HomePod directly from the Mac. iGeneration reports that the HomePod will be getting a new feature called 'Force Fix your Wi-Fi network', which will make it easier to change the connected Wi-Fi network and force the HomePod to use the same Wi-Fi network as the iPhone. Currently, the user has no idea to which SSID the HomePod has connected to. Calling features are not necessarily new. Google Home owners in the US and Canada had calling abilities close to a year ago while Amazon Alexa currently supports device-to-device intercom with dialing features expected to arrive soon. Apple hasn't revealed a timeline as to when HomePod owners can expect the OS 12 update but it should be around the same time when iOS 12 lands on iPhones. Do note that the above features are still in beta and can be pushed to future releases if not complete.